NARRATIVE: The Spokane Fire Department responded to a reported house fire in the early morning hours of February 14, 2009 only to find light smoke in the residence and the owner very agitated. The damage was minor confined to the light smoke in the house. The cause is of concern and that was a discarded cigarette into the trash. Fortunately the resident of the house was awake and noticed the small fire in the kitchen area then called the Fire Department. Her smoke detector was on the kitchen table without a battery as she had not been able to get to the store to replace the battery. 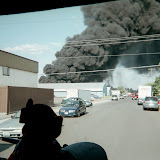 The Spokane Fire Department would like to remind the public of the dangers of improperly discarded smoking materials as well as not maintaining a working smoke detector in the house. The damage was minor in this incident and nobody was injured but that is not always the case with improper disposal of cigarettes and or not maintaining working smoke detectors. The Fire Department did ventilate the house and put a new battery in the smoke detector prior to leaving the scene. MORE EMS IN THE MOVIES! CPR!! Knowing how the American Heart Association keeps changing things, maybe this protocol will come back. I hope not. If you find any other FIRE or EMS related movie scenes on the internet, send them my way. Attention Clothing Committee - Looks like it's the Snuggie! Will be a little while for the next questionnaire. But, I could use some help. The survey will ask "what codes would you like to see on the FDM that aren't on it right now?" An example might be: "637 Pants/Suspender entanglement - not life threatening." I only ask that when you submit your entry that you remember the public (including the media and city council) read the blog too. So mail them into me! NARRATIVE: The Spokane City Fire Department dispatched fire crews and their apparatus to 1737 E. Sanson at 12:09 in the very early morning on Wednesday, Feb 11th, for a reported structure fire. The first arriving fire crew reported heavy smoke coming from the roof and eaves of a single story wood/frame dwelling and radioed their intent to enter the structure with a charged fire lead in an attempt to locate the fire and extinguish it. As the other incoming fire apparatus were approaching the scene, the Incident Commander began making assignments to them that included search and rescue, additional fire hose leads, ventilation (both horizontal and vertical), water supply, and fire scene safety. The crews inside the structure reported heavy smoke conditions which hampered their progress somewhat as they struggled against the heat and smoke. They were finally able to get to the back bedroom where the fire is believed to have originated and, once there, got a fairly quick knockdown of the fire. There were no reported injuries to the fire fighters or to the tenants. Early discovery of the fire by one of the tenants, especially because of the time of the night, contributed to their successful escape from the house at a time when conditions inside were rapidly becoming critical. The house sustained very serious smoke damage throughout as the thick, black smoke that was present inside covered nearly all of the contents in the structure. The bedroom where the fire originated was completely destroyed and a good-sized hole had been cut in the roof of the house to allow the pent-up heat and toxic by-products of combustion out of the building. Ceilings were pulled and walls were opened up inside the building to allow the fire fighters to be able to fully extinguish any stubborn hot spots that were still burning. Investigators from the Spokane Fire Dept. 's Special Investigation Unit were on the scene trying to determine the cause of this early morning fire and at the time of this report no conclusions have been reached. PROBABLE CAUSE: Currently under investigation by the Spokane Fire Dept. 's SIU. DAMAGE EXTENT: Severe fire damage to the bedroom of origin, heavy fire and collateral damage to other areas of the buiding, and severe smoke damage to the entire interior and contents of the structure. Greg still hasn't turned in his article, so there is no newsletter yet for February. Tonight is the union meeting. There are, according to the ISP logs, many in Australia who check out the Local 29 Blog. Please accept our thoughts and prayers for you and your families as you deal with these devastating fires. Maybe there is more we can do than that. I don't know. Firefighters, you are doing a fantastic job against very terrible odds. Know that your brother and sister firefighters in Spokane are cheering you on. That seems like a lame thing to say without any action to back it up. Any ideas out there?